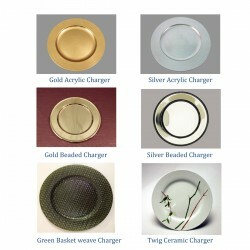 Chargers & Trays There are 8 products. 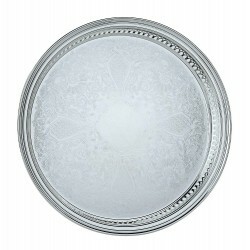 Set the tone from the start with our classy Round Silver Tray Collection and impress your party guests. Ideal for weddings, home dinner parties, corporate banquet or social event. 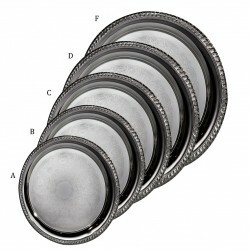 Selection: 10" Round Silver Tray 12" Round Silver Tray 14" Round Silver Tray 16" Round Silver Tray 20" Round Silver Tray Choose your desired tray and confirm your rental period. Set the tone from the start with our classy 15" Gallery Tray and impress your party guests. Ideal for serving drinks at weddings, home dinner parties, corporate banquet or social events. Please confirm your rental period before making purchase. 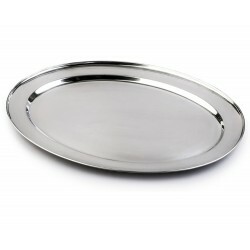 Set the tone from the start with our classy Oval Round Silver Tray Collection and impress your party guests. Ideal for weddings, home dinner parties, corporate banquet or social event. Selection: 18" Oval Silver Tray 24" Oval Silver Tray (Fish) 25" Oval Silver Tray Choose your desired tray and confirm your rental period. Set the tone from the start with our classy Rectangular Silver Tray and impress your party guests. Ideal for weddings, home dinner parties, corporate banquet or social event. 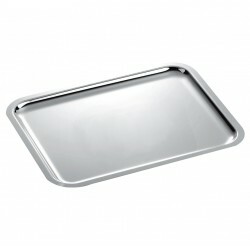 Selection: 21" Rectangular Silver Tray 33" Rectangular Silver Tray Choose your desired tray and confirm your rental period. 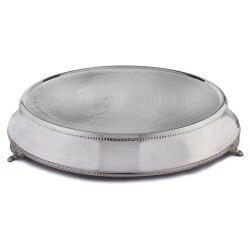 These cake plateau is silver plated with embossing on the sides & outter edge of the top. Perfect use for wedding cake stand, centerpiece, cupcake bottom layer, or to display any major highlight item. 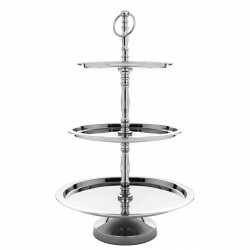 This 3-Tier Silver Stand will make an attractive addition to any table setting. 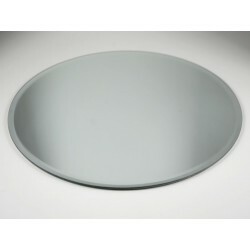 Our Round Mirror Trays are a stunning addition to home and event design. To add a shimmery and dancing glow simply add candles atop the mirrors and watch how the light reflects and bounces around your surroundings. Perfect for Weddings, Parties, Church functions, restaurants, and the home.